To query a feature in 2D or 3D view mode, click the Select tool , then click on a location in the View window. To select more than one feature, click and hold the left mouse button, then drag the cursor around the desired area. Note: Selecting features in 3D mode works in a slightly different way: when you click on a feature in 3D, the tool will select all the features along an imaginary line that goes straight through the View window. In other words, it will also select all the features located directly behind the one that you click on. Information about the feature(s) displays in the Feature Information window. If multiple features are selected, the feature whose information is currently displayed in the Feature Information window is highlighted. Clicking the arrow beside a section name expands/collapses the information in that section. Raster datasets display additional information that includes row/column, location, band and palette properties, and palette keys and values. Mousing-over grayed-out text provides summary information without having to expand a section. Some attribute values may be truncated because they are too large to display in the Feature Information window. Double-click on any value to display it in full in a separate window. There are several display and search options at the bottom of the Value window. Mouse over each option to display its description. Displays the number of features that have been queried in the View window. You can use the arrows to scroll through these features or enter a number into the text box to view information for a particular feature. You can also use the Up arrow key on the keyboard to increase the text box number, and the Down arrow key to decrease the text box number. You can use standard operating system functions to select any entries in the Feature Information window, contiguous or non-contiguous. After selecting, right-click and select Copy Text or Copy Text With Indentation. Copied text can then be pasted into a separate application. Copy Text: Copies selected text, excluding any whitespace characters. Copy Text With Indentation: Copies selected text, including any whitespace characters. Use this option when you want to attempt to preserve indentations or columns when pasting into a spreadsheet. Alternatively, you can output all the data about a feature in the Feature Information window to the Log window, then save to a text file. Click anywhere in the Feature Information window, and select Log This Feature. Feature Type: Displays the feature type of the currently selected feature. This area also contains information about whether the feature is 2D or 3D, the number of vertices in the feature, and minimum and maximum bounding box values of the selected area. This section displays all the attributes and attribute values of the currently selected feature. 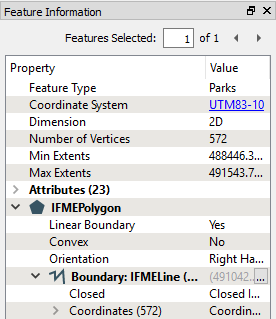 For more information on attribute types, open FME Workbench help, and see the topic About Feature Types. This section of the Feature Information window displays all the geometry information for the currently selected feature. 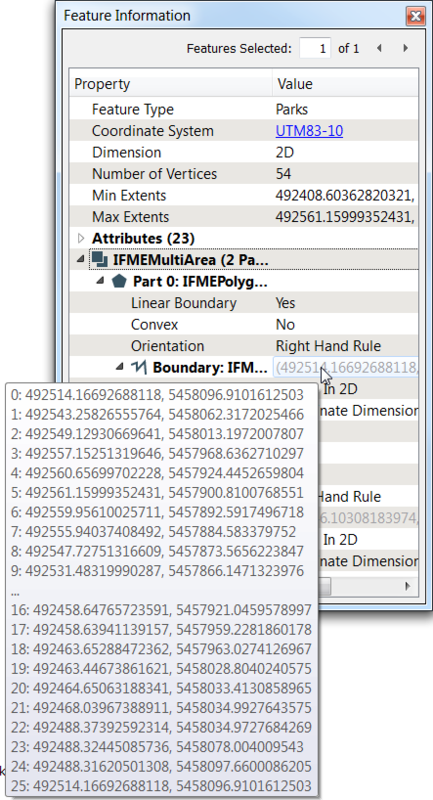 It is headed with the name of the FME Geometry Type to which the feature belongs. A full listing of all geometric information for the feature (coordinates for all geometry types, information about measures, transformation matrixes, raster bands, and so on). Tip: If you click on the coordinates of a point listed in the geometry section of the Information window, the point is marked in the View window. 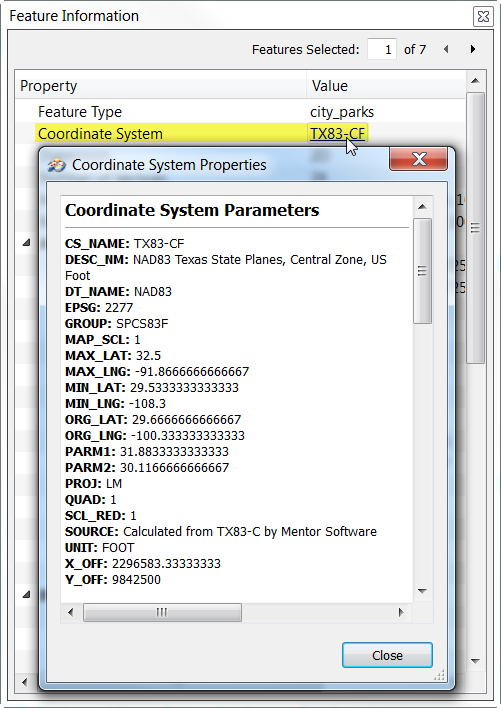 You can also choose to display coordinates and text insertion points in the View window.